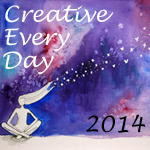 Ways to share: Once you've signed up, you can leave a comment on this post and/or use the "Mr. Linky" widget below to link to a blog post(s) or flickr image of your creative activities during the days of 1/6/14 - 1/12/14. Theme: January's totally optional theme is Past, Present, & Future, which you read more about here. Glad to be here for another week. Interesting because I was reminded of the theme as I worked on one project I am not happy with, so instead I shared something else that is, lo and behold, related to past, present and future! Here is my contribution to Past, Present, and Future. I chose the guardian of the Underworld, Cerberus. Unlike Janus he looks at the present: the here and now. I was a little unfocused this week. At times I stayed with the them mostly looking to the future as I was working on things to create in for the future. But all in all I will say I thoroughly enjoyed some new experiments. I will try to zone into the theme a bit more one some projects in the next week. This is a really good theme for the beginning of the year and I enjoyed doing my art journal page. However, my first linky didn’t work, no 23. I did it right the second time (no 27) but I can’t delete no 23 which isn’t working. I have linked up today, but I have difficulty linking you to my post. Will try later!